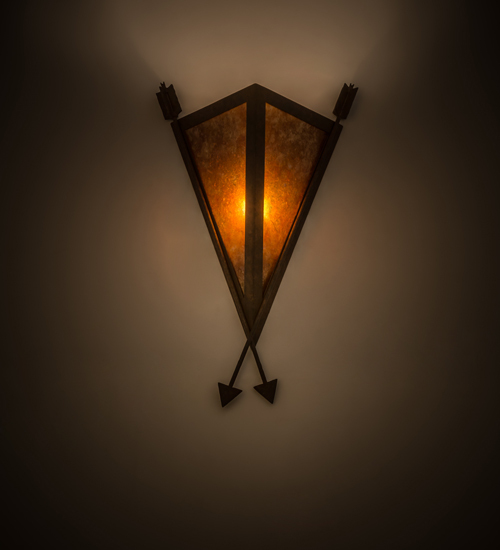 Description: Highlighted with a dramatic styled Arrowhead shaped diffuser, the Desert Arrow wall sconce will enhance your interior space with welcoming illumination and a striking profile. The stunning Amber Mica shade is complemented with an arrow-shaped accent, frame and hardware featured in a handsome Rusty Nail finish. This handsome sconce can also be used a vanity light in a fine bath. Custom crafted in the USA, this fixture is available in custom sizes, styles, colors and dimmable energy efficient lamping options. The 20-inch tall sconce is UL and cUL listed for damp and dry locations.